We’ve been watching a lot of No Reservations recently. You’ve heard numerous times about our culinary addiction to Anthony Bourdain’s Les Halles Cookbook and at this point, you’re probably tired of seeing his name on this blog. This time, he didn’t write the recipe at all, but he has inspired us to be bolder with food. Let’s be clear: this isn’t the Guinea pig he ate in Peru nor is it the stuffed Sheep’s bladder he ate in Ireland, but it’s a step in that adventurous direction. This time, we’re not venturing very far in the world like he does on each episode. What we’ve cooked tonight is commonplace in many southern gas stations at 99 cents per bag. Admittedly, we’re not huge fans of the from-the-bag-pork-rinds… so this is somewhat of a bold move for us. Results? 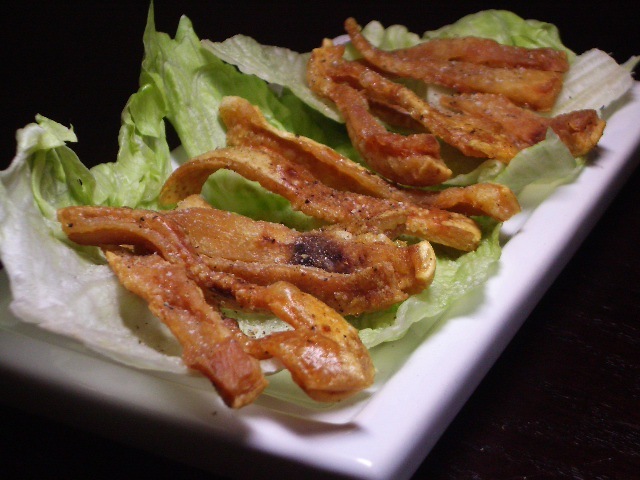 Porky, crispy, salty and delicious! The recipe couldn’t be simpler and the taste is wonderful. While we hope to make this again, part of the deliciousness of this preparation might come from the kind of pork rind we used, which is from an Ossabaw pig. You might remember when we made cassoulet and needed pork rind? We saved some of the good stuff for another pork rind special occasion and here it is!